In 2003 I started really working online PR using PRWeb's platform. I tried them all. In fact, at RichContent, we broadcast into many different online PR channels. But if I had to use just one, it would still be PRWeb. (David McInnis sold PRWeb to Vocus for $28 million in August 2006. It was a wild and engaging ride, and I'd do it all again in a heartbeat). (Click the image for more detail, or download the complete PDF below). Pleace keywords front and back of your Summary. Lead with a strong first paragraph. A real grabber if possible. Follow with a 2-part quote from a credible individual. Add high-level but key industry-related info. Follow with another key quote. Signature block (company) and PR Firm (if separate). As I mentioned, this is far from all inclusive. 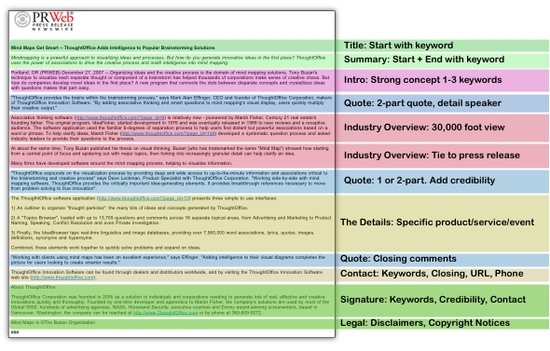 We have another, much more detailed document on how to optimize every area of a press release. If you'd like it, please send an email and I'll forward it to you. To see the actual press release, view the ThoughtOffice PR on PRWeb. OK, the sun is shining (rare here in the Pacific Northwest) so I'm tying my Nike's and headed down the hill. Have a phenomenal '08, and I look forward to seeing you in the news. Nice to see someone else out there loves online PR as much as I do! It's such a powerful tactic yet few companies really take advantage of it in a way that harnesses its full potential. Great post here too, I especially enjoyed the graphic you've supplied of the "Ultimate Online Press Release." Great idea there and very helpful. We should definitely share ideas and compare notes. I've been browsing your site to try to get a better idea of how the Universal Search Broadcast Platform you mentioned in your comment on my SEO blog works. Also, could you give me the URL of the site you mentioned that includes "How-To" and stats? Either way, thanks for your participation and discussion, and keep up the good work! Yes, Online PR is such a great "sport" in terms of SEO-SEM, branding... you name it. I worked a bit with David Meerman Scott last year on his book The New Rules of Marketing and PR. David is another great guy to know. He's a master of taking a vertical subject and building great book-quality content and domain expertise. The 1st link CSS stylesheet is gone, but we'll fix that. Let's close this loop soon. I am out of town this week and most of next (Seattle-MacWorld-Salt Lake-Portland), but would love to chat in more detail. As soon as I return, let's also get you a peek behind the curtan of RichContent. We've got our clients happening now, and will be opening the publis interface by the end of the month (we're staffing up editorial right now, and making sure the message is dialed-in). Here's to an awesome '08!